I was suprised when I opened Scratch recently because the whole look had changed. It turned out that new version was released on January 2, 2019. It’s called Scratch 3.0. The new look itself doesn’t affect much on functionality, but there are some completely new features. First of all, I’d like to notify plugins. You can make your program speek with Text to Speech. There are around 10 major languages and some minor, like Icelandic. There are two human-like voices (alto and tenor), two more altered (squeack and giant) and one joke (kitten). To test translate tool, you must put translation block inside some other block. For example say (Hello) for (2) seconds -block under Looks is good for testing. I tried this and translated English sentences to Finnish and I was surprised how well it worked. Micro:bit is simple, small device designed by BBC. It has 5×5 LED display, buttons and motion sensors. In comparison to famous Rasperry Pi 3, micro:bit is simpler. With Scratch, you can for example make texts show letter by letter in micro:bit’s display. Lego Mindstorm EV3 is more high-end product for building robots from bricks, and it also works with Scratch now. One thing worth noting is that you can set your character’s initial position, direction and size straight away under your game window. This is quick and easy if you want for example to make you sprite certain size. However, if you want to set starting position to object that will move during the game, you must still use go to block at the beginning of your code. Of course, there are some new backdrops and sprites and also an option to set suprise sprite or backdrop. That will certainly give some new and refreshing ideas! 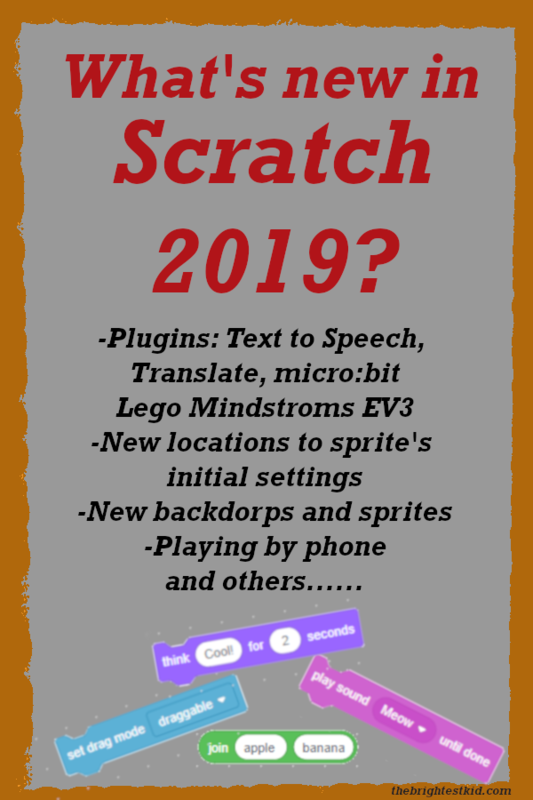 Author thebrighPosted on January 14, 2019 January 14, 2019 Categories UncategorizedTags Education, ScratchLeave a comment on What’s new in Scratch 2019?